Let's face it. The way things are going, humanity is going to keep advancing in technology and eventually create our own extinction. The robot takeover is only a matter of time! So before artificial intelligence conquers the world and enslaves mankind, take the time now to learn how to blend in with our soon to be metallic overlords. 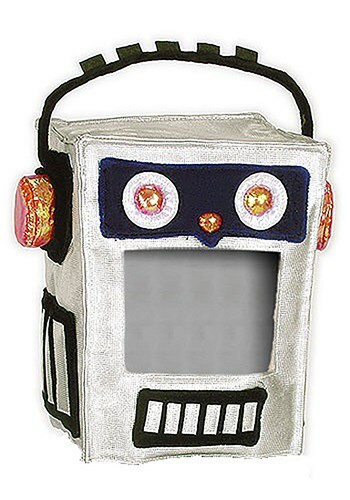 This Robot Mask Hat will be perfect for getting into the mindset of a bot! Add it to the rest of your robot costume and you'll be ready for the impending usurping humanity will bring upon itself. Besides getting the look down, you also have to become an expert at binary code and mathematical equations if you don't want to be found out by human-hunting androids! If you ever have trouble coming up with a quick answer just start yelling, “Error! Error! Does not compute. Error! Nonsequitur!” The other robots will think your circuits are frying and assume you must have a different primary function. Well, hopefully with this Robot Mask and your acting skills, you can infiltrate the AI before it's too late but, if not, enjoy surviving the apocalypse!